What’s on the menu? This children's sewing pattern for a girl’s double-breasted unlined jacket has band collar, gathered empire waist, and cuffed long sleeves. Optional bias trim to finish facing edge and seam allowances. The A-line skirt child's sewing pattern features front pockets and back kick pleat with elasticized back waistband. 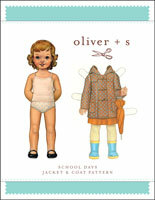 Share your photos on Instagram with the hashtags #sundaybrunchjacket and #oliverands. 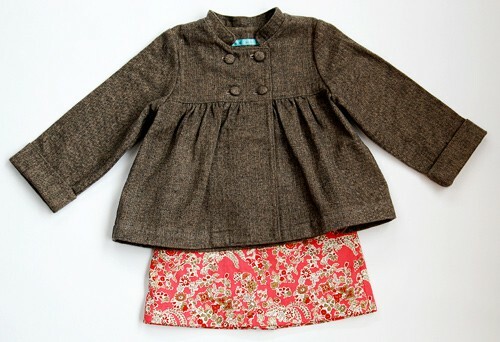 Girl's jacket and skirt. Double-breasted unlined jacket has band collar, gathered empire waist, and cuffed long sleeves. Optional bias trim to finish facing edge and seam allowances. A-line skirt with front pockets and back kick pleat with elasticized back waistband. After successfully sewing this pattern, you will have developed the following skills: bias binding, bias bound seams, buttonholes, collar, flat-set sleeves, front hip pocket, gathering, and kick pleats. Light- to medium-weight woven fabrics like quilting cottons, broadcloth, linen, denim, chambray, seersucker, fine-wale corduroy, velvet or velveteen, wool gabardine or crepe. Skirt: 1/2 yard 3/4" elastic. Jacket Length 12 1/4" 12 3/4" 13 1/4" 14" 14 3/4"
Jacket Chest 22" 23" 24" 24 1/2" 25 1/2"
Skirt Length 6 1/2" 7" 7 1/2" 8" 8 1/2"
Skirt Hip 21" 22" 23" 23 1/2" 24 1/2"
Jacket Length 15 1/2" 16 1/4" 17" 17 3/4" 18 1/2"
Jacket Sleeve* 19" 20 3/4" 22 1/2" 24 1/4" 26"
Jacket Chest 26 1/2" 26 1/2" 28 1/2" 29 1/2" 30 1/2"
Skirt Length 9" 9 1/2" 10" 10 1/2" 11"
Skirt Hip 25 1/2" 26 1/2" 27 1/2" 28 1/2" 29 1/2"
This pattern was a pleasure to sew up- I used a liberty needle cord and it turned out beautifully. Lengthened the hem a few inches otherwise it would have seemed a little short to me. Would love if there was an optional lining pattern included too. 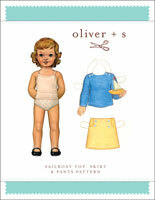 I purchased this pattern mainly for the skirt, as I am creating a handmade uniform wardrobe for my daughter. 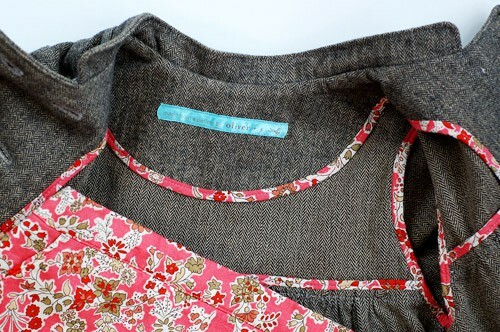 The skirt is so easy to sew up and the little kick pleat is so adorable. It's easy for her to move in and it makes a very smart outfit. A wardrobe staple for sure! I love your patterns in general, but this one turned out so cute! I've made two, one in a sweet cotton print and the other I lengthened and made out of pin wale corduroy for a light fall coat. Both are adorable, if I do say so myself! I made this dainty little jacket for my daughter and it has quickly become a favorite. The digital pattern is easy to print, join and trace. Everyone has commented on how professional it looks: the bias-bound seams, the little collar, the pretty gathering all around... it just looks very well finished. I made this jacket out of a stretch denim for my granddaughter who is 7 years old. It was easy to put together and the style is perfect. I love your patterns! I absolutely love this pattern! I have made it twice, both times in size 2T, using underlined double gauze cotton for the jacket the first time and underlined wool the second. I used ponte di roma and wool for the skirts, again both underlined. I will definitely make it again, perhaps in a larger size. Well drafted, clear instructions, a joy to make. There are pictures and a review on the Pattern Review website. I made this in "Frozen" fabric for my 4 yr. old grandgirl. She loves it and wants to wear it all the time. The pattern was wonderful, instructions are so very good and easy to follow. I even got brave and added Hong Kong seam finishes. It's a hit! Like nothing I have sewn. 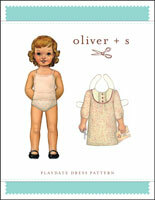 This was the second ever Oliver+S pattern I sewed. It just confirmed my love affair. I had never seen such an elegant but still entirely practical piece of children's clothing. Beautifully cut, I have made three sizes and all went together so nicely. I used corduroy, as they were to be smart play clothes, but I have seen many luscious wool versions as well as being lucky enough to receive a Sarvi hand-me-down in AMH velvet. Swoon. Some girls like to add some length to the jacket, but don't over do it! The jacket sits nicely at the hips. The skirt is just so ducky! The tiny size is tiny, if you use cloth nappies, size up, but oh so cute on a little fat bottom. The bigger size is perfect, my older girls wore the size 8 until 12 years of age (with added length). I think the smaller size jacket would also make a gorgeous Euro style boys jacket. I would put it on a bonnie wee lad. Enjoy the sewing experience. I know I did. This is a very exciting jacket to make. The options for the partial lining give you a chance to use small amounts of brilliant fabrics and play with contrasting bias trim for some fantastic looks. 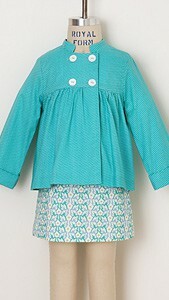 The jacket fits very well and makes a very chic little suit for a girl. 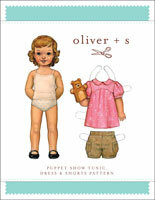 The instructions are what O+S is known for -- I have learned to sew wholly from these patterns with no other instruction -- but don't forget the gorgeous lines and fit. Do not be misled by the fact that these are offered as PDFs. These are NOT mere tutorials -- they are the same high quality, professional patterns with precise, full size pattern pieces as the paper patterns, presented in a print-at-home (or print at copy shop) format. The following errata notes apply only to the earlier printed version of this pattern. These errors have all been corrected in the current digital version. Skirt: Pattern piece #10, skirt waistband: for all infant sizes (6-12 months through 24 months), please add 3/4" to the back edge of the waistband. For all other sizes (size 2T through size 8), please add 1" to the back edge of the waistband. Jacket: Pattern piece #1, front yoke: for all sizes, shift the lefthand button and buttonhole markings 3/8" toward the center front. Please note the following change to the instructions. On page 2, 3rd column at the bottom step 6: Press the bias strip toward the seam allowances. Then re-fold the bias strip so that it wraps over the seam allowances to the facing's right side, and pin the strip's folded edge from the right side so that it covers the seam line you sewed in Step 5. As errata are discovered, they are marked for correction in subsequent printings of the pattern. To determine which printing of an instruction sheet or pattern sheet you have, look at the copyright box which appears on each. Toward the bottom of the box, there is a series of numbers. The lowest number you see there indicates which printing you have. For example, if the lowest number in the box on the instruction sheet is "2," you have an instruction sheet from the second printing. Any errors in the instructions mentioned for the first printing have been corrected in your version. If the lowest number in the box on the pattern sheet is "1," you have a copy of the pattern sheet from the first printing. Pattern sheets and instructions sheets can be printed separately, so be sure to check the errata notices for pattern pieces against the printing number on the pattern sheet and errata notices for instructions against the printing number on the instruction sheet. Discussion on the digital sunday brunch jacket + a-line skirt sewing pattern from the Oliver + S Discussion Forums. Find and share more photos on Instagram using the hashtags #sundaybrunchjacket and #oliverands.